It has already been a month since I stopped my training for the boat surveys and started to go on on-effort during surveys. It is great not having to sit in the backseat anymore and be in more of the action. I still make small mistakes sometimes and that worries me because I want to pull my own weight after all the help I have already received from everyone. Over the weeks the number of Chinese White dolphin sightings have seemed to decline, but the finless porpoise sightings have been increasing. One important thing to note is that Chinese White dolphins prefer estuarine waters, whereas finless porpoises like oceanic water. Besides inhabiting different waters and having a different diet, the two species also behave differently. 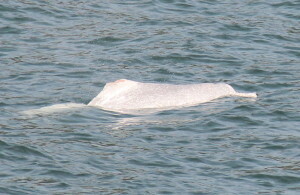 Usually, Chinese White dolphins are less shy then porpoises and they often mill around our boat. Finless porpoises often just peep their melons out for an instant and then vanish. Lately, It is almost as if the two species have switched identities. During the last weeks of February we had an explosion of porpoise sightings. On a boat survey we spotted more then sixty porpoises! 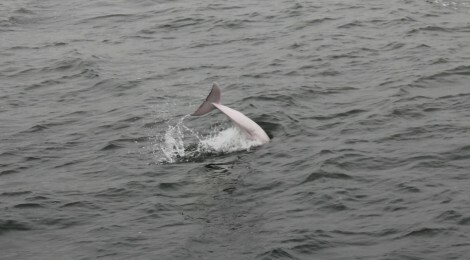 One very memorable experience was when a small porpoise came within two meters of our boat and we saw its entire body. 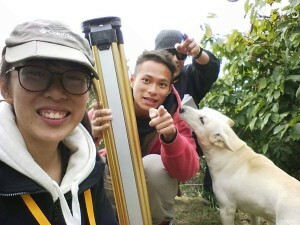 Then there was the Shek Kwu Chau land-based survey where we observed more then twenty porpoises throughout the day. The porpoises were bobbling their melons on the waters surface and a couple of them even spun their bodies so that their bellies and pectoral fins were exposed out of the water. What I found most amusing was when seabirds started trying to land on the floating porpoises; it actually helped me spot the porpoises when the birds did this. The Shek Kwu Chau land-based survey made me appreciate land-based survey more because on that day I had a much closer look at how finless porpoises behaved without any human disturbances. In general, finless porpoises are more sensitive to the sound and presence of our boat then Chinese White dolphins, so spying on them from land revealed a whole array of unique behavior that I may not be able to see on a vessel survey. Heading into March, the weather became warmer and as a result, we have started encountering algae blooms on many of our boat surveys. We started seeing much fewer dolphins and porpoises, and we often wondered if this was because of the algae blooms. 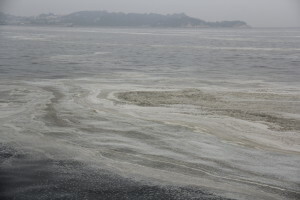 The water was initially red but as the days went by the blooms climaxed to a caramel foamy sludge in South West Lantau. We even saw some dead fish-floating belly up in the water as we surveyed. Whenever we saw porpoises breach out of the water, they would leave an impression in the algae sludge, it was almost like the ocean became a swamp. We did spot one dolphin on March 1st, but its dorsal fin was cut off and it sustained lacerations around its peduncle and fluke. The wounds were fresh and the team thought that gill nets from the local fisherman most likely caused these injuries. It was a sad sight but fortunately the dolphin was still very mobile. I find this internship captivating because we can cooperate with other organizations towards a common goal. A national geographic photojournalist came aboard our boat and used a remote control drone to take videos of our survey. Unfortunately, he wasn’t able to take any footage of cetaceans, but it was enjoyable listening to him interview Dr. Hung during the survey. Whenever, Dr. Hung gets interviewed its like getting a free lecture, its pretty awesome 🙂 . 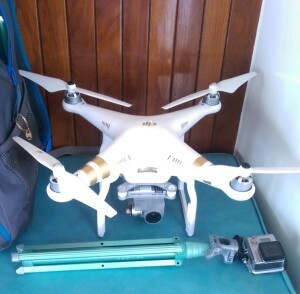 A drone, and it actually works! The ones that I see at the night markets fall apart pretty easy.